Mina Holland was born on 7 March 1865 at Bridgwater in Somerset, the daughter of William Thomas Holland and his wife nee Florence Du Val (1). In 1892, during a visit to her Kipping relatives in Manchester, Mina Holland met William Henry Perkin, who was staying there with his friend Frederic Stanley Kipping while on holiday from his studies in Germany (2). He was born at Sudbury in Middlesex in 1861, the son of Sir William Perkin (3). Mina Holland (4) and William Perkin shared a great love of music, and he was an excellent pianist. After he returned to Munich they exchanged letters. 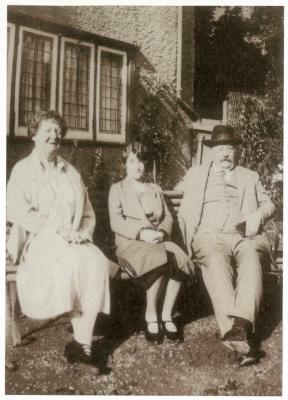 In 1886 he came back to England, and spent a year studying at Owens College (now the University of Manchester), during which time he made visits to the Holland family at Bridgwater (5). In 1887 William Perkin was appointed Professor of Chemistry at Heriot-Watt College in Edinburgh. On 31 December 1887 William Henry Perkin married Mina Holland at Bridgwater. They had no children. In 1901 their address was 34 Wilbraham Road, Withington in Manchester. By then William Perkin was Professor of Chemistry at Manchester University. In 1911 they were living at Fairview in Wilbraham Road, which was probably the same address. They moved to Oxford in 1912, when William Perkin was appointed Professor of Chemistry there. Mina Perkin died in 1948 at Oxford aged 83 years. Her husband William Henry Perkin had predeceased her, having died at Oxford on 17 September 1929 aged 69 years. (1) An account of the life of Mina Holland and her two sisters is given in The Holland Sisters by E.G. Rochow and E. Krahe (2001). This is a semi-fictionalised narrative that has been adversely criticised by William Brock in Chemistry and Industry dated 1 October 2002. But despite its fictional style, the book does but contains some factual information and photographs supplied by Brian Kipping, a descendant of Frederic Stanley Kipping and his wife nee Lilian Florence Holland. (3) Sir William Perkin was a chemist who in 1856 produced a chemical called mauveine. It was the the first synthetic dye, and produced a colour that became known as mauve. He patented it, and manufactured the dye in vast quantities at his factory in Greenford, Middlesex. (4) Although a passage in The Holland Sisters (page 78) suggests that Mina Holland acquired her name as a diminutive of "Willemina" after her father William, she was more likely to have been named after a favourite aunt Jemima Hampton Renney who went to live with the family in Bridgwater and indeed died there in 1894. She was known in the family as Mina. (5) The Holland Sisters by E.G. Rochow and E. Krahe (2001) pages 80-84.